This dessert is a take on your more common vanilla pot de creme. It could easily be turned into a creme bruleé by burning some sugar on top. The cardamom and saffron add a unique flavor that is both delicious and unexpected. Heat half + half, vanilla, cardamom, and saffron in a saucepan over very low heat for 10 minutes. Whisk yolks and sugar together until mixture turns pale yellow. While whisking, pour a ladle full of cream mixture into yolk mixture. Add this cream and yolk mixture into the rest of the cream in the saucepan and whisk for a couple minutes. Pour mixture into four individual sized ramekins and put them in a baking dish. Pour boiling water into baking dish until it reaches halfway up the sides of ramekins. Bake for about 45 minutes, or until center is barely set. 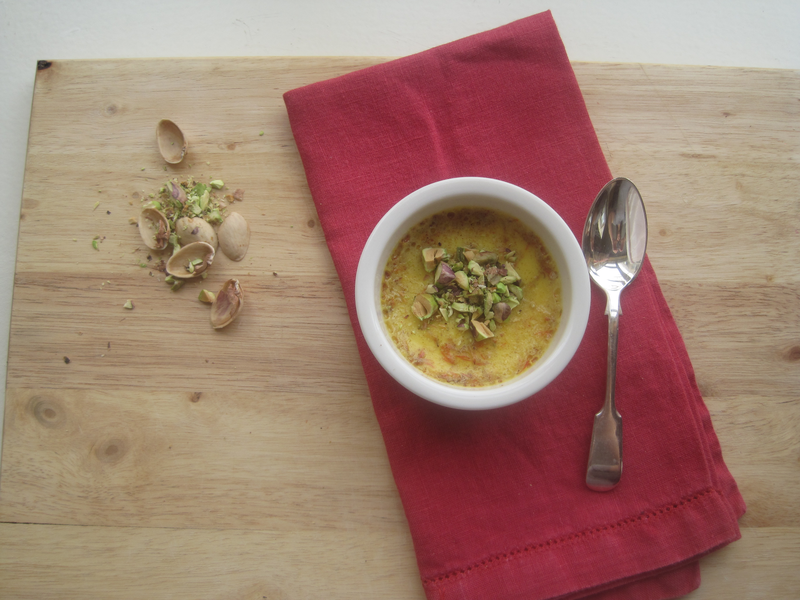 Chill, top with pistachios, then serve. Delicious! I was hoping for the pork to be a texture closer to bbq pulled pork, but the big chunks of meat were still very tender. Next time I’m going to try roasting it at a lower temperature, maybe 300º F, for a bit longer. 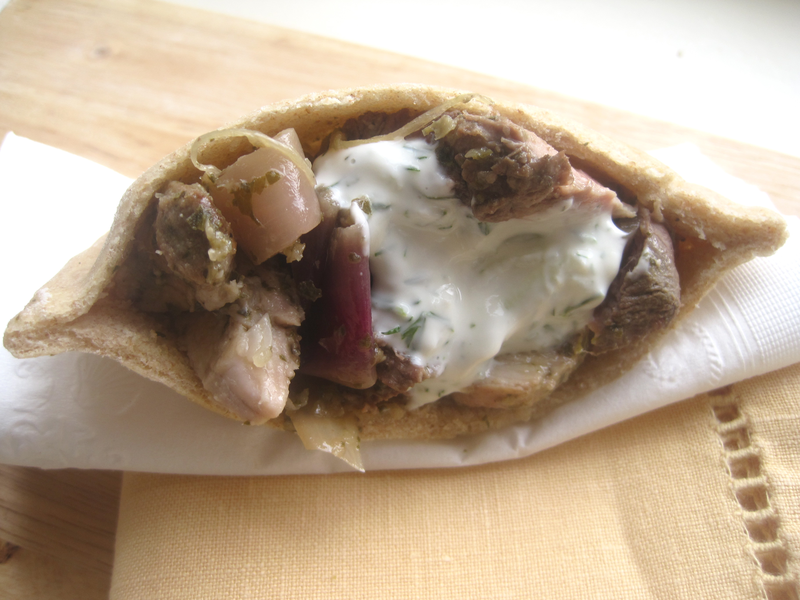 I served this with a Greek-style warm tomato and bean salad. 1. Combine pork, vinegar, olive oil, onion, oregano, 2 cloves chopped garlic, salt, and pepper in a ziploc bag. Let marinate in fridge for at least an hour. 2. 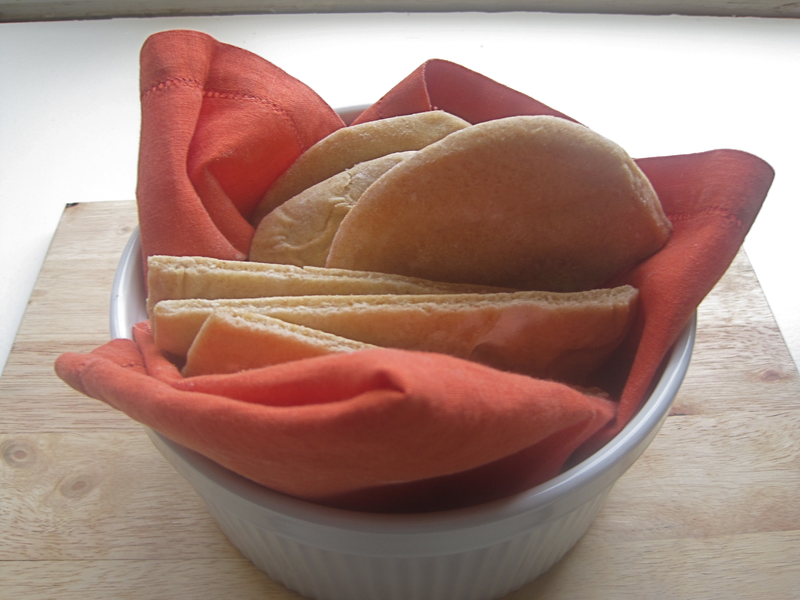 Preheat oven to 320º F. Pour contents of ziploc into a baking dish. Let sit at room temperature for 20 minutes. Roast for about 3 1/2 hours. 3. While pork is cooking, mix yogurt, cucumber, lemon, dill, 1 clove chopped garlic, and 1/4 tsp salt in a bowl. 4. 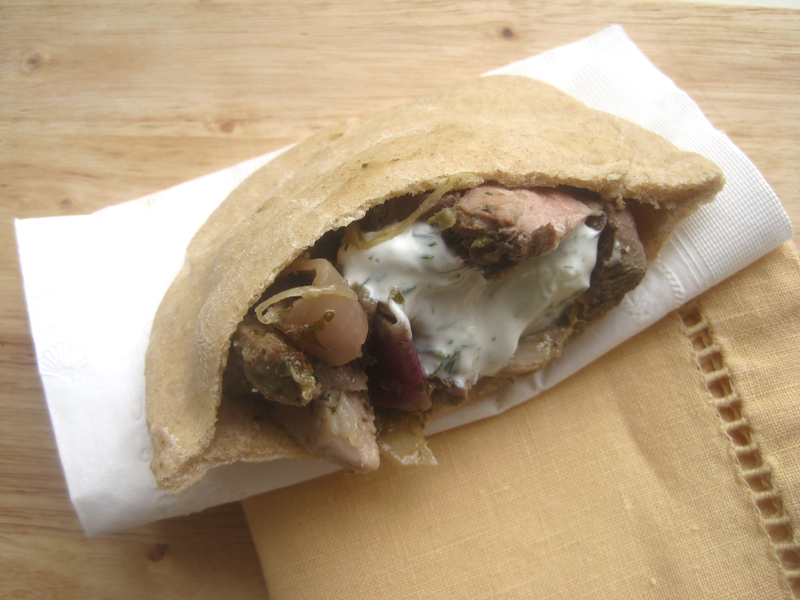 Fill warm pita pockets with roast pork, onions, and tzatziki. The more ripe the bananas, the better. If you don’t have any overripe bananas, you can roast them in a 350ºF oven for about 10-15 minutes, or until the skin is dark brown. This will help bring out the intense and sweet banana flavor. 1. Whisk together flour, baking powder, baking soda, and salt in a medium bowl. In another bowl, use an electric mixer to combine eggs, brown sugar, butter, bananas, and vanilla. Mix for about 2 minutes. Add dry ingredients to wet ingredients and mix together. 2. Add batter to greased (12 large) muffin pan, but only fill about 1/3 way up. 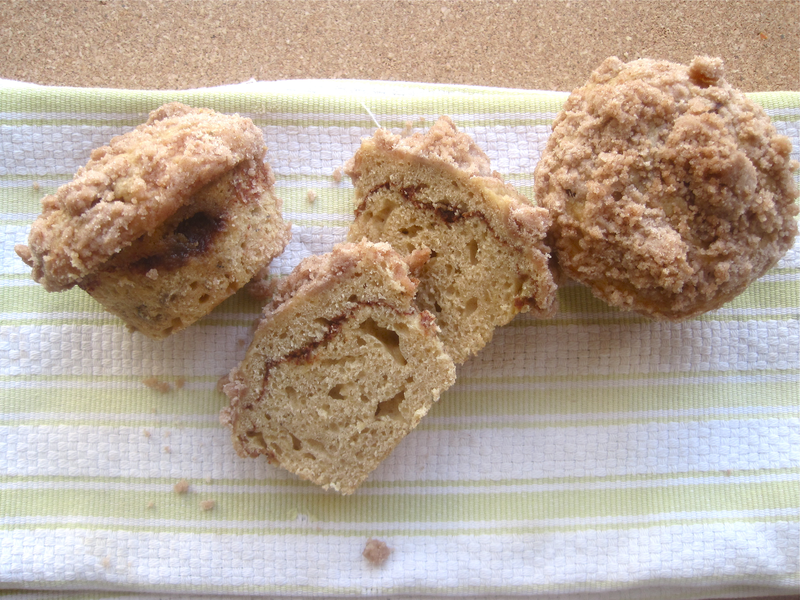 Distribute cinnamon swirl mixture over muffin batter in pan.Fill the muffin pan with the remaining batter. 3. 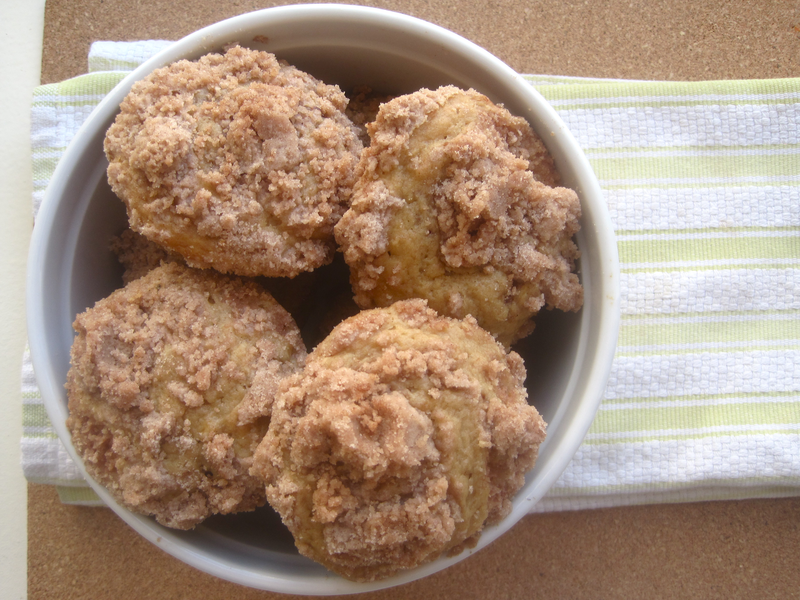 Sprinkle crumbly streusel mixture over the top of each muffin. 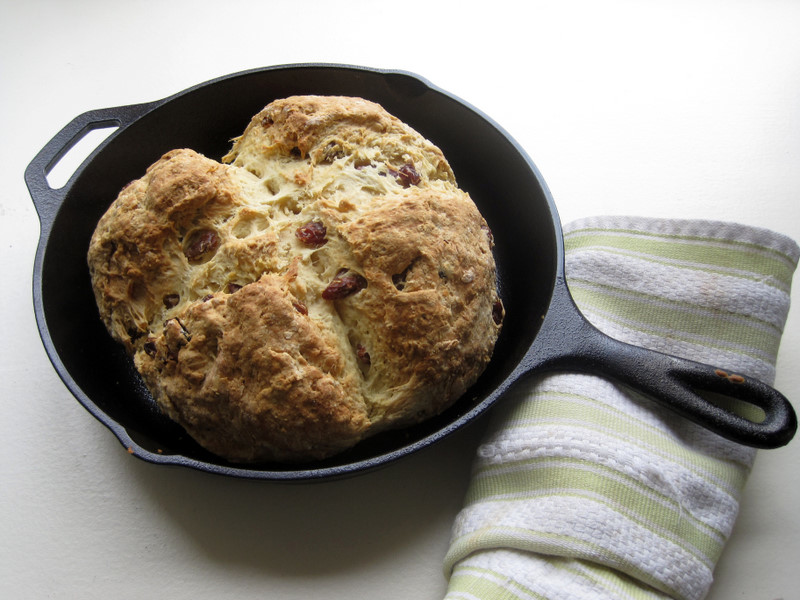 Bake for about 25 minutes at 350ºF. 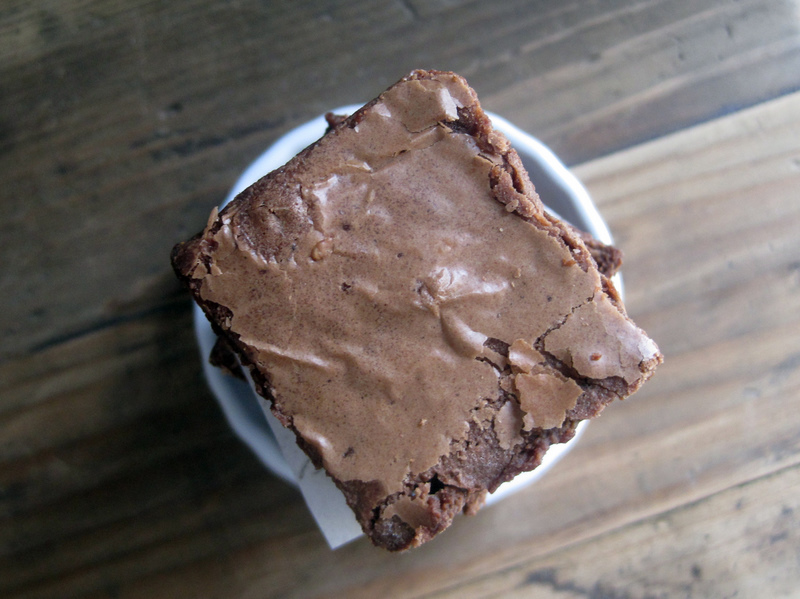 I came up with the idea of baking sesame and wasabi brownies after eating Vosges Black Pearl flavor chocolate, which has ginger, wasabi, and black sesame inside. 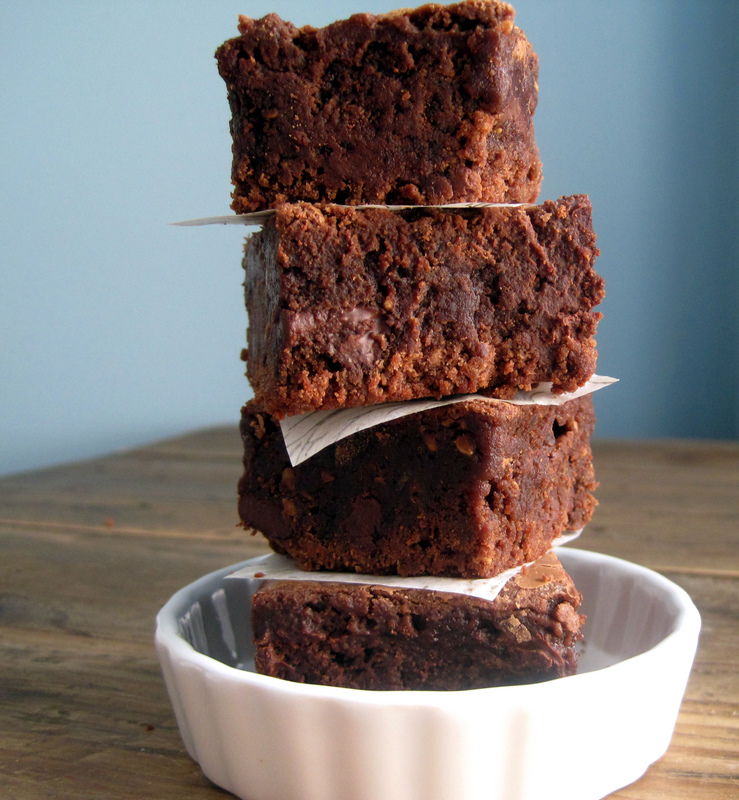 Although I used 3 tbsp of wasabi powder, these brownies did not turn out spicy at all! Otherwise, they were nutty, chocolatey, and fudgy. I think that next time I make these, I’ll try using wasabi paste instead of powder. 1. Preheat oven 375ºF. Grease a square baking dish. 2. Mix butter and unsweetened chocolate in a heatproof bowl. Set bowl over a saucepan with 2-inches of simmering water. Stir frequently until melted. Turn off heat, but keep mixture warm by leaving bowl in saucepan. 3. In a large bowl, whisk together eggs, sugar, and vanilla. In another bowl, sift flour, wasabi powder, and salt together. Pour warm chocolate into egg mixture and mix together. Pour flour mixture into wet ingredients and stir together until combined. Fold in chocolate chips and sesame seeds. 4. Pour into baking dish. 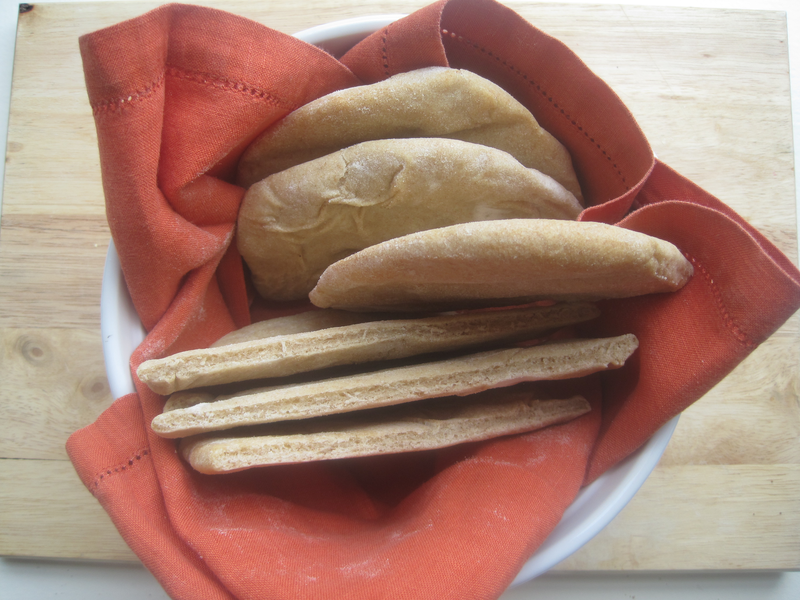 Bake for about 20 minutes, or until toothpick comes out clean. 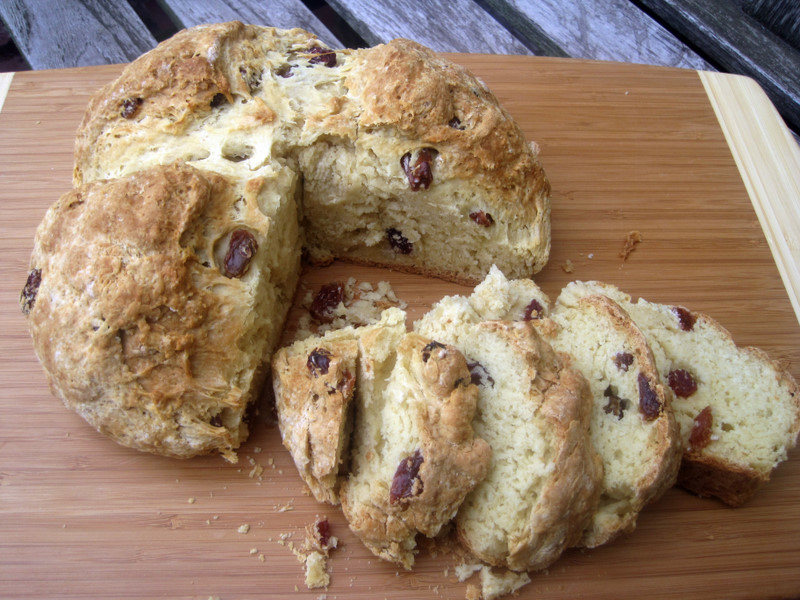 This recipe makes an enormous quantity, so you may want to cut it in half. It takes a while to make, so I like to cook enough stew to last a few days. The dish is adapted from my step-grandmother’s recipe, the flavors of which come from her years living in the Middle East and Eastern Europe. 1. In a large pot over medium heat, saute onion, tomato, zucchinis, carrots, butternut squash, cabbage, rutabagas, and turnips in olive oil and 1/4 cup butter for about 10 minutes. Vegetables should be roughly chopped, about 1-inch square. 2. Add broth, meat, chickpeas, 1/2 tsp saffron, 1/2 tsp ginger, 1/4 tsp black pepper, parsley, thyme, and bay leaves and cook with cover over medium-low heat for about 1 and 1/2 hours, or until meat and vegetables are tender. Remove bay leaves, any large bones, and extra skin from chicken. 3. 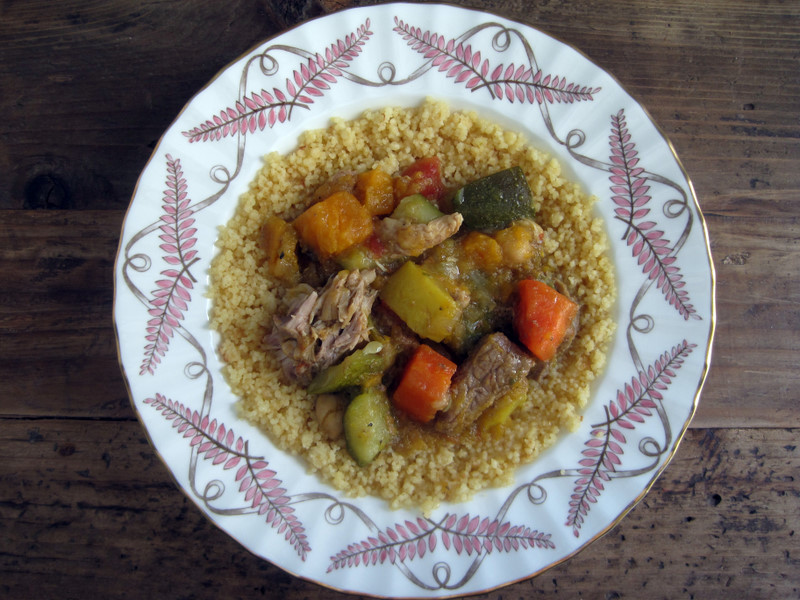 Cook couscous according to package instructions, but add remaining herbs and salt to the water. 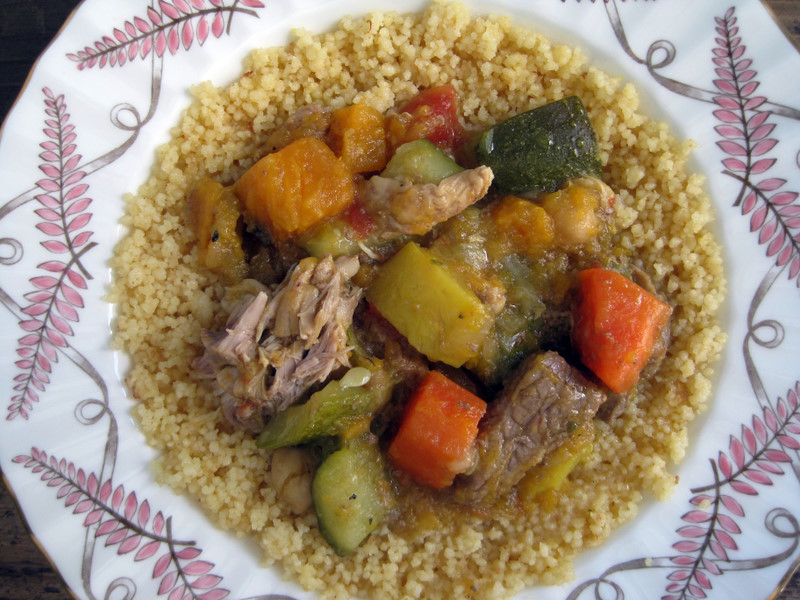 When couscous is finished cooking, add 1/4 cup butter and fluff with a fork. 4. 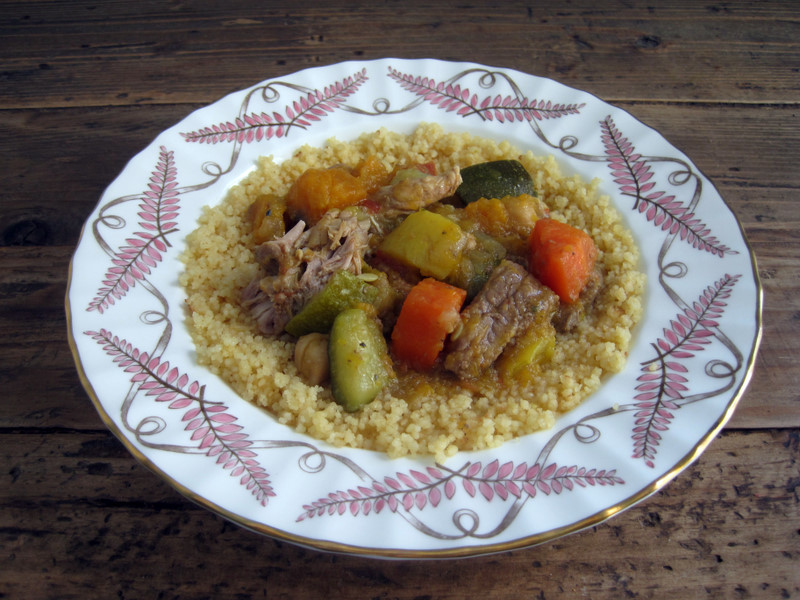 To serve, ladle stew over couscous in large serving platter or in individual bowls.